This could well be the best and easiest soup you’ve ever made. It’s getting chilly now. 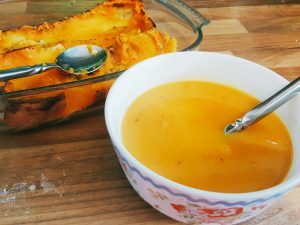 The mornings are darker, its misty and night time turns up quicker than ever, although as I write this I have sun pouring through the window, challenging my decision to post about warming soup… It’s November though and as far as I’m concerned that’s soup season. Winter soup does what summer salad never can. It warms you from the inside, it soothes you and it comforts you. And let’s face it, sometimes we all need a bit of soothing. Even if you don’t cook this is super easy. You do need something to blend it with at the end but you can use a hand blender, a food processor or even a nutribullet or equivalent. Ok, so how do we do this?! Whack your oven on about 180 fan. Get a sharp, strong knife and cut the squash in half lengthways, then scoop out all the seeds. Use the knife to score the flesh so the oil and seasoning can get right in there. Peel the garlic cloves and cut them in half. 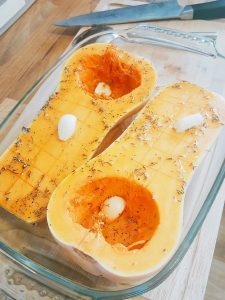 Rub them over the squash and then leave them dotted around the halves. 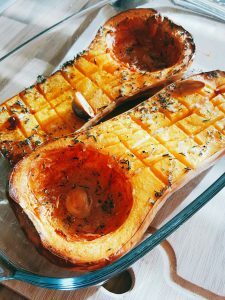 Pop the dish into the oven to roast until the butternut is super soft and squdgy and easy to scoop out of its skin, usually around an hour. 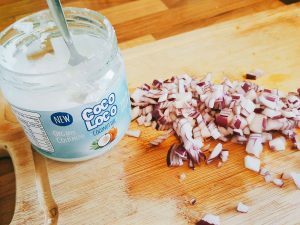 Finely chop the red onion and fry in the coconut oil over a low heat in a saucepan. Scoop all the orangey flash of the butternut squash out into the pan and fry for a minute. Add the stock and bring to the boil. Remove from the heat and allow to cool for a little while. Then blend until smooth in your chosen blender/bullet/processor and serve! The soup will last a few days in the fridge, covered, so it’s perfect for making at the start of the week and enjoying for lunch for a couple of days. Serve with bread, or rice crackers, or rye bread if you’re feeling flash and healthy… You can also drizzle with natural yoghurt for even more creaminess. You. Are. Welcome. Site Configuration & Finish by Dave Byrne -- Powered by WordPress.